Lake and Trails Outdoor Youth Camp is a four-year program, with young sportsmen and sportswomen adding to their outdoors skills each year. The outdoors skills classes are being conducted by experienced instructors, as well as Ohio Division of Wildlife officers, Akron Power Squadron representatives and certified NRA instructors. The first year of the camp focuses on an Ohio Hunter Safety Certification, featuring an introduction to small-bore rifle, pistol, archery, air rifle, primitive living, shotgun and muzzle loading rifles on the various ranges. Second-year students learn primitive living techniques, trapping, taxidermy, and basic watercraft safety. They also enhance their range shooting skills and attend various evening clinics, including knife making. 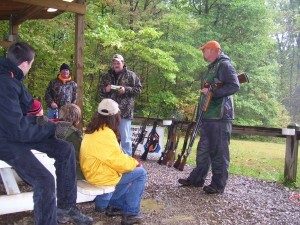 During their third camp, youngsters will pursue boating certification through the Ohio Boaters Education Course and have the opportunity to learn advanced shooting and archery techniques. Fourth-year students complete the program with advanced shooting instruction on the firearms and archery ranges, sporting clays, high ropes clinic, deer processing, advanced cooking, and evening clinics on various outdoor sports and a live pheasant hunting experience with trained field dogs. Anticipated cost for youth 10-17 years old is $130.00 and accompanying adults are $140.00 each. Contact Harvey Bechtel at 330-620-6909 if interested in attending this camp. Registration will open in July.